As anyone who has lived in the 20th century knows, architects boast the best eyewear. I understand this as absolute fact, and it makes sense. Architects are a bit arty, so their eyewear is arty as well. They are often responsible for making sure buildings do not topple, so their eyewear is arty, yet not so arty that it falls off their faces. This truism has come up because I am due to get new glasses and must face those dreaded five hours called "picking out frames." I tend not to wear glasses in public for fear that a five-on-five pickup basketball game may start. In that case, I want to make sure I am wearing my contacts. Of course, a few deceased celebrities, including Charles Nelson Riley and Harry Caray, might have worn distinctive eyewear that rivaled the architects. 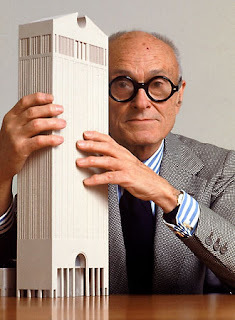 But, hey, architects stand alone as having the coolest glasses.